Living a Fit and Full Life: Wake Up and Go to Sleep Naturally with the New Philips Hue White Ambiance A19 Starter Kit! Wake Up and Go to Sleep Naturally with the New Philips Hue White Ambiance A19 Starter Kit! 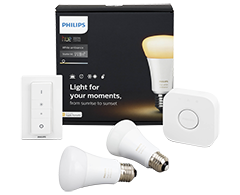 I absolutely love this Philips Hue White Ambiance A19 Starter Kit! It comes with everything you need to get you up and running and is super simple to set up. What I love most about the new Philips Hue White Ambiance A19 Starter Kit is that it actually helps me fall asleep faster and gently wakes me up in the mornings. I've been able to stop using my alarm clock entirely and simply wake up naturally since the light brightness increases gradually mimicking the effect of sunrise. It's an incredibly pleasant way to wake up! Not being startled awake by an alarm clock every morning has actually helped me wake up in a good mood and be ready for the day. Philips Hue White Ambiance helps you to feel better and allows you to customize your daily routines. I've been using the relaxing warm white light in the evenings and have noticed I fall asleep much faster than I used to. I used to go to bed and lay there for what seemed like hours at times. Now in the evenings I notice myself yawning much more and seem to fall asleep about as soon as my head hits my pillow. I'm amazed at what a difference the Philips Hue White Ambiance has made in my life! Click HERE to find a store near you that sells Philips Hue products! Click HERE to learn more about Philips Hue! Follow Philips Hue on social media!